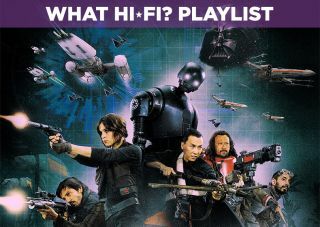 Star Wars: Rogue One – Blu-ray review | What Hi-Fi? Rogue One is the Star Wars' series first standalone film and it's an enjoyable, if flawed, entry. Following on from the success of Star Wars: The Force Awakens was the much anticipated Rogue One, directed by Gareth Edwards and the first of a number of anthology films that focus on events and characters from the Star Wars canon. Based on an idea by John Knoll (a visual effects supervisor at Industrial Light and Magic), it's an expansion of a line in the opening crawl of A New Hope that mentions a daring raid by the Rebel Alliance to steal the Death Star plans. With reports of massive reshoots that reportedly altered the tone and ending of the film, Rogue One isn't without its flaws but it is, for the most part, an entertaining effort. The plot follows Felicity Jones's Jyn Erso who became estranged from her father Galen (Mads Mikkelsen) after he was kidnapped to create the Death Star. When she's found by the Rebel Alliance, Jyn is sent on a mission with Rebel spy Cassian Andor (Diego Luna) and his robot K-2SO (Alan Tudyk) to retrieve Bodhi Rook (Riz Ahmed), a pilot who defected from the Empire and was captured by Rebel extremist Saw Gerrera (Forest Whitaker) on the planet of Jedha. Bohdi has a message from Galen that indicates a fatal flaw in the Death Star's design, leaving the Rebels no choice but to steal the plans in order to destroy this super weapon. The idea for Rogue One is fascinating, though arguably the film comes across as a bit confused and convoluted in its execution. Instead of a film that's centred around capturing the plans, it begins 15 years earlier to introduce a father/daughter dynamic that's rather underdeveloped. The middle act is flabby, which curbs the film's momentum and is followed by a huge battle that's exciting enough but overstays its welcome. Events feel slightly fortuitous and there's an inconsistency to characters, tone and pacing that's probably down to the extensive reshoots. Despite that, Rogue One is fun. The section on Jedha engages the most, introducing likeable characters such as Donnie Yen's Chirrut Imwe (who gets a fantastic action scene) and Wen Jiang's Baze Malbus, as well as allowing Tudyk's K-2SO – a reprogrammed Empire droid with an attitude problem – some amusing comic relief. These three give the film a core of interesting, funny and engaging characters that you can't help rooting for. Though there's no opening crawl, trademark editing wipes or wordless coda, there's no doubting this is a Star Wars film, with references peppered throughout. In some ways it's too indulgent. The appearance of Darth Vader is well done (apart from a groan-inducing pun) and in one brilliant scene he's let loose on some "Rebel scum". However the presence of Vader is not crucial to this story. He does not need to be there. Felicity Jones as Jyn puts in a commendable performance. Her story is the bedrock of the film though it feels affected by the reshoots. She's initially cold to the Rebel cause, but finds a purpose and a resilience that brings out her more noble virtues. Diego Luna's Cassian has shades of darkness. His willingness to compromise his morals for the Rebel Alliance is interesting, though it's not wrapped up in a satisfying way. Both could use more in-depth characterisation - as could Ben Mendelsohn's Orson Krennic. Considering Krennic is the film's main antagonist, he's behind Vader and Tarkin (Guy Henry) in importance and apart from his introductory scene, has no real impact or control over the narrative. One more point is Rogue One's unflattering portrayal of the Alliance. Quite frankly it doesn't work tonally or match up with the Rebel Alliance we see in A New Hope. It's another sign of a film that's a little confused about its identity. There's no confusion about the Blu-ray, which is another beautiful presentation from Disney. While Rogue One is aesthetically similar to the original trilogy, we'd wager it's a dirtier, grittier and earthier film (Rogue One was mastered in 4K, making this a great choice if/when Disney embraces the format). Considering it's aping a film made in the 1970s (making it some sort of period fantasy), the attention to detail is excellent and the Blu-ray brings out the various tones and textures that make this world feel unmistakably 'Star Wars'. The costumes look fantastically retro and the locations are distinct and diverse, with the bright, sun-drenched colours of Eadu popping off the screen. Blacks are very deep and well defined. If there is an issue (and it's not to do with the presentation per se), it's with the two motion-captured characters. The recreation of Peter Cushing's Tarkin and Carrie Fisher's Leia is ambitious, but the former is hampered by the lighting which reveals how artifiicial he looks. Tarkin's skin has an unreal grey, veiny pallor that nixes the effect. Leia's appearance is brief, but her one line is delivered with a stiffness that makes it look fake. It's not terrible, but it is noticeable. The soundtrack can be pretty thunderous and it is another victory for attention to detail as the Star Wars universe is faithfully recreated. Even in busy scenes, such as the space battle that closes the film, the clarity and positioning of effects is terrific. Nothing gets lost in any kind of audio soup. The audio presentation immerses you in this richly conceived world. Michael Giacchino's score has a great presence, aping John Williams' work (The Imperial Suite is a riff on The Imperial March). It's a score that easily settles in this universe, with a few great themes like Guardians of the Whills. It's not quite the match of Williams' scores, but then few are. Rogue One has a great central idea but doesn't quite follow through on its potential. From its diverse cast, its female-led story and shady/morally compromised characters that add a semblance of complexity, there are interesting elements here that don't always mesh into a whole. Like The Force Awakens, the story could be more robust but otherwise the production design, music, cinematography and (most of) the CGI effects are very well done. From an AV point of view you can't argue with the presentation Disney has produced here. There are plenty of bonus features on the disc which are revealing if a bit short. It's another entertaining entry in the Star Wars canon and in audio-visual terms is a belter.